An image makeover for everyone. Give me some advice, Interwebz! Change is the name of the game for the variety world…and love, apparently. While the PDs are running around trying to think of new ways to save their shows, cupid is also wreaking a little havoc in their love lives. At this point, it’s more likely that the 2D1N team somehow gets their ish together before anybody figures out what’s going on with their own love lines. 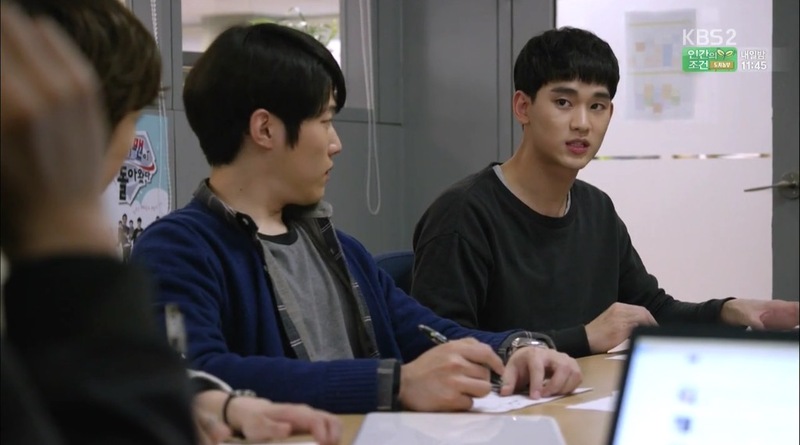 What I do know for sure is that I wanna see the cherry blossoms of Yeouido with Kim Soo Hyun while he buys me pancakes. But c’mon, who doesn’t want that? NOT JUST FRIENDS | Seung Chan is so troubled by discovering Joon Mo and Ye Jin’s secret “affair” that he’s even having nightmares about it. At least he’s dreaming about variety shows! To confirm that this ain’t just a typical one-night stand, he steals their milk delivery and sees that there are two bottles. While Seung Chan is just getting more confused with each new piece of info, things aren’t exactly rosy in the JoonJin household. Joon Mo makes fun of her for not acting like normal cutesy girls, so Ye Jin retaliates by talking smack about his girlfriend, Hae Joo. Joon Mo tells her that she’s just jealous that she can’t seem to hold onto a man for herself. Ye Jin left for work annoyed, but her mood is instantly brightened when she runs into Hae Joo in the bathroom and finds out that she and Joon Mo broke up yesterday. PAYS TO STUDY | Joon Mo is not only stressed at home, but he’s stressed at work too. The 2D1N team has to think of a brand-new concept and cast for their show after that whole debacle with the actresses. Seung Chan tells them that he’s been studying Korea’s variety show history and discovered a trend cycle for when certain concepts become popular again. According to his calculations, if they made 2D1N into a matchmaking show, e.g. We Got Married, then it might become popular…in 2016. So much for that, right? Help us, oh wise one. IDOL RECRUITMENT | Even though Joon Mo wasn’t buying the matchmaking concept, the Variety Dept. Chief totally does. The one condition he has is that they cast popular idols instead of the middle-aged actress group from before. And because one of the senior PDs in the department is going around convincing agencies to sign his daughter as an idol trainee, they reluctantly allow their idols to go on 2D1N to avoid signing his daughter. It seems like the show pulled off a miracle by casting all these idols in less than a day, but disaster strikes when one of them, EXID’S Hani, gets arrested for a drunken brawl. To replace her, Joon Mo goes all the way to the JYP HQ to recruit Suzy for the show. Yeah, no, that’s definitely not happening. JYP goes out of his way to avoid even discussing it with Joon Mo. Man, it sure ain’t easy being a PD. ALL HUNG UP | Ye Jin tries her hand at the “damsel in distress” act when her car gets blocked, but is only able to get Seung Chan to show up and help her. He takes this opportunity to find clues about her and Joon Mo’s secret relationship, especially because he’s even more confused now after seeing Hae Joo and Ye Jin acting all chummy earlier. 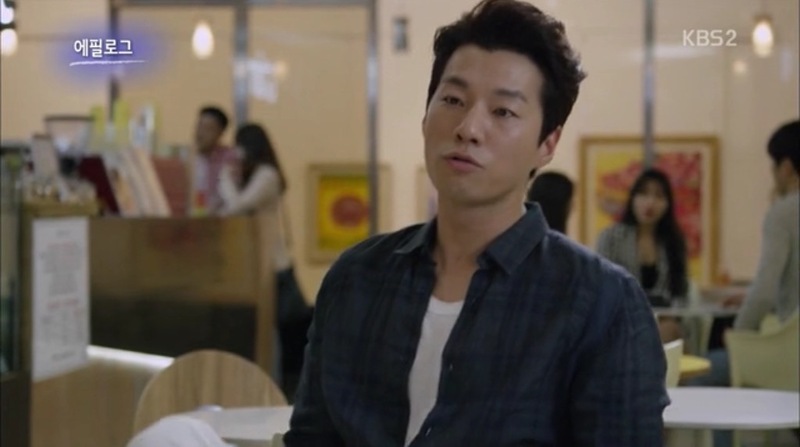 Instead of being subtle about it, he straight-up asks Ye Jin if she has a boyfriend. She tells him no and to mind his own business. Well, that definitely didn’t clear things up. At home, she keeps calling Joon Mo, but his phone is turned off. Her lil bro totally knows what’s up, and tells her that she has to play a little more hard to get to win over guys. ANTI-FAN | Cindy’s fans somehow found out about the dressing room argument, so now they’re blacklisting Ye Jin. Ye Jin doesn’t get it though because Cindy’s poor attitude has earned her a bunch of anti-fans. But please, Cindy already knows this and even joins one of her own anti-fan clubs. 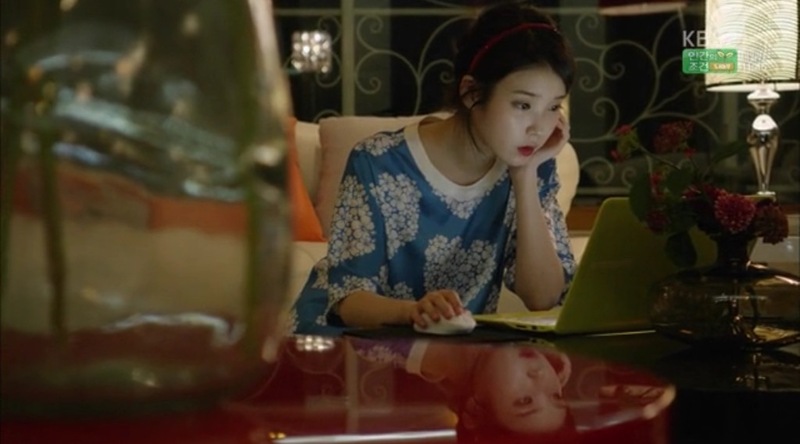 She receives a message from Seung Chan asking about the umbrella he lent her. When he only sends messages urging her to quickly return it before he gets fined, she can’t believe that’s all he wants. But if more Seung Chan is what she wanted, then that’s what Cindy will be getting when Joon Mo sends him to recruit her to be Hani’s replacement on 2D1N. Fun fact: Seung Chan saved Cindy’s number in his phone as “Umbrella Return.” Lol. Men are jerks, part 2. IMAGE CHANGE | Seung Chan goes to find Cindy at rehearsals to 1) retrieve the umbrella and 2) convince her to join 2D1N. She asks him why she should join the show when it seems like there’s nothing in it for her. He tells her that there have been many celebrities who became top stars after joining variety shows because it allowed for the audience to see them in a new and refreshing light. Cindy looks like she’s buying what Seung Chan’s selling, until her agency’s CEO Byun comes barging into the room. When Joon Mo arrives later, he quickly puts an end to the discussion. Looks like those two’s got some real bad beef between them. Before the meeting, Cindy thought that Seung Chan liked her and was using the umbrella as an excuse to hit on her, but she’s not sure anymore. What’s a girl to do? She goes on a message board to ask for relationship advice, of course. BLAME THE SOJU | Joon Mo and Seung Chan grab dinner together with two other PDs after failing to find an idol replacement for the show. The seniors make sure that Seung Chan’s soju glass is full, even though he definitely cannot hold his liquor. He stumbles out of the place, tipsy as hell, and finds his way to Joon Mo and Ye Jin’s apartment. He still has the pancakes that Ye Jin told him to buy for her earlier, so he’s here to give them to her. As he’s holding onto her hand, Seung Chan leans forward…and passes out in Ye Jin’s arms. Sigh. Pancakes + Kim Soo Hyun = The Dream. THIRD PARTY | Remember how Joon Mo said that Ye Jin can’t seem to hold onto any of her boyfriends? Well, those exes of hers (Jang Hyuk & Lee Chun Hee) were interviewed and reveal that they didn’t break up because he cheated. The actual reason for it was none other than Mr. Ra Joon Mo. These ex-boyfriends totally knew that Ye Jin liked Joon Mo, and couldn’t deal with it. See, it was that obvious to everyone. Chun Hee & that F.O. life!